under the small umbrella: Senna is a go! This is how it seems to work at the moment. I have a look around the old haunts of the internet and come across some great pieces. This time it's the first set of images for the upcoming documentary about the life and death of Ayrton Senna. Ayrton Senna at GP de Belgique in Spa Francorchamps, Belgium in 1991. Ayrton Senna at the GP do Brasil in Sao Paulo, Brazil in 1993. Ayrton Senna at the GP di San Marino in Imola, Italy in 1994. It was June 1984, a Sunday at the Monaco Grand Prix. As the heavens unleashed a torrential downpour, one of the greatest line-ups in motor racing history took to the track. No fewer than six current or future World Champions vied for the race that day, including recent World Champion Keke Rosberg; a stoic, fearless Englishman called Nigel Mansell; Austrian double World Champion Niki Lauda; the flamboyant double World Champion Nelson Piquet; and the man dubbed ‘The Professor’, Frenchman Alain Prost, who was on the cusp of being regarded by many at the time as the most complete driver ever. In 13th position on the grid meanwhile, attracting little interest in his un-fancied Toleman car, was a wiry, fiery young driver in just his sixth Formula 1 race. As the engines fired and the drivers tore through the city streets, the man that started in 13th place ripped through the field, demonstrating virtuoso technique and jaw-dropping courage as he passed every car in front of him, taking Prost on line of the 32nd lap. 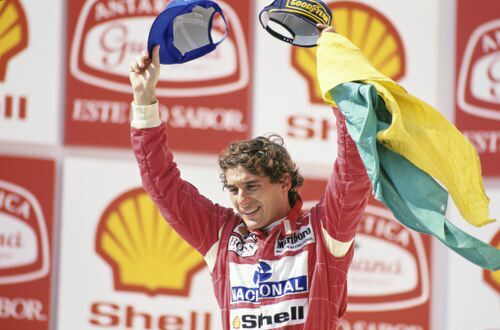 That man was Ayrton Senna, announcing his arrival to the world of F1 with a spectacular drive. 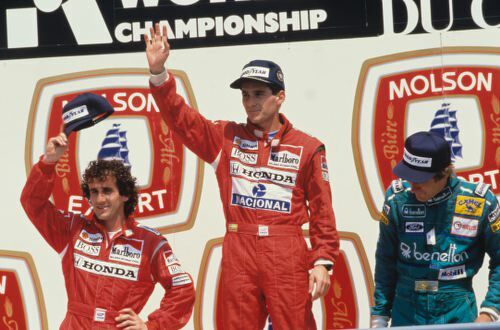 As it transpired, Senna did not win the race; he lost out on a technicality and the first-place passed to Prost. At the time Senna was not bitter, it was still his first podium finish, although what happened that day would set the tone for the young Brazilian’s future career; he would frequently win on the track, but would find himself defeated off the track, struggling against what he perceived as injustices in a highly politicised sport. 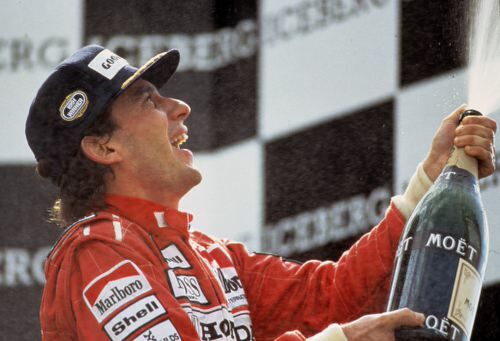 Still, he overcame obstacles placed in his path, won three World Championships — his years at McLaren forging a fierce rivalry with team member and rival Prost — and achieved superstar status across the globe. With the international press he proved a charming and dashing champion; to his native Brazilian media he was a humble and deeply religious man. At the peak of his powers however, while tackling the Imola track in San Marino, disaster struck. It was the third race of the 1994 season and during qualifying Senna’s protégé Rubens Barrichello crashed and hurt himself. A day later Austrian driver Roland Ratzenberger slammed into a wall at 200mph, dying instantly. 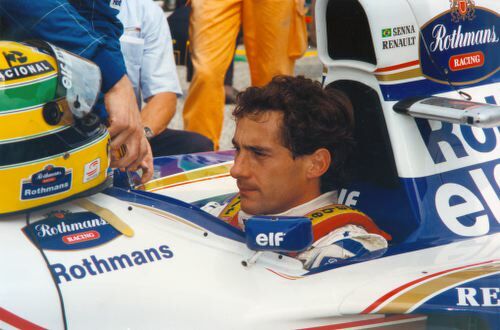 Senna was shaken and wondered whether to continue racing. His great friend and F1 doctor Professor Sid Watkins advised Senna not to race on the Sunday. But Senna’s pride, his sense of responsibility to his team and sport, and his absolute need to conquer his fear, propelled him on. On the Sunday of the race, Senna managed just two laps after the safety car pitted, before crashing on the high-speed Tamburello corner, his car hitting a concrete wall at more than 130mph. In 1987, Nelson Piquet had crashed at the same corner and emerged with a mild concussion; in 1989 Gerhard Berger came off at Tamburello and exploded in a ball of flames. He was hurt but survived. In 1994, when Senna crashed, his car hit the wall at such an angle that part of the suspension flew back and punctured his helmet, causing fatal skull fractures. Medics found an Austrian flag in his car: he had planned to honour Ratzenberger when he finished the race. Senna’s remarkable story, charting his physical and spiritual achievements on the track and off, his quest for perfection, and the mythical status he has since attained, is the subject of SENNA, a documentary feature that spans the racing legend’s years as an F1 driver, from his opening season in 1984 to his untimely death a decade later. Far more than a film for F1 fans, SENNA unfolds a remarkable story in a remarkable manner, eschewing many standard documentary techniques in favour of a more cinematic approach that makes full use of astounding footage, much of which is drawn from F1 archives and is previously unseen.